This week we are putting the spotlight on a community member who is organizing a project for a potential Lego future building set. 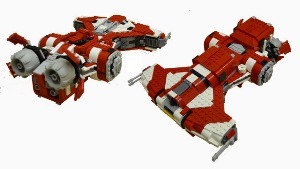 This particular Lego project has to do with the SWTOR spacecraft, the Corellian Defender. The steps for getting projects or ideas made into actual building sets has to first go through the Legos Cuusoo process. On this article, I called in a couple junior writers and proficient Lego builders…two of my nephews. They helped with the questions. Let’s get ready to find out more about the Corellian Defender project and also the guy responsible for it, as well as being our guest for this week’s Community Checkpoint. Tell us a bit about yourself and how you got into LEGOS and eventually into this project? Like most people I got into Legos as a kid. Then I “grew out” of them. I kept up a bit because I have always been into comics, toys, etc… Then in 2007 my “Dark Ages” ended. That is a term we AFOLs (Adult Fans of Lego) use to describe the return to the Lego hobby. Lego produced this set called the Aero Booster that is a like a Mech with a giant rocket pack. That kinda broke the dam. I started working on gaming scale designs of ships from the old spelljammer game I used to play and hunting down old Lego sets I had (or wanted) as a kid on bricklink. What helped a lot was the virtual Lego building programs like Lego Digital Designer and LDraw. Those programs let me explore with a lot of designs while not having a lot of brick. Then I finally met up with my local Lego User Group (LUG). Those are organizations of people who basically explore the possibilities of Lego. Usually LUGs are limited to cities but Texas has to do everything bigger so we have “TexLug”. Well, I started meeting up with other Lego fans and I gotta tell you, they are a great bunch of people. The kind of crazy stuff people can do with Lego is just really mindbending. At the same time it is a very open environment and everyone is eager to share. Now to circle this back to the Corellian Defender. One of my old college buddies works on SWTOR. I am in Austin so I actually know a few of the staff. So I have gotten to see this Defender for a long time, even though I have only recently gotten a computer powerful enough for the game. I fell in love with the ship right away. To begin with, I like anything with a hammerhead motif, but the shape, coloring, and callback to “earlier” ship designs all appealed to me. My buddy knew I was looking for something interesting for Cuusoo and challenged me to make it. I took him up on it and that is how the ball got rolling. It has evolved a lot since then though with the addition of figures and such. My original design was to “statuette” scale (which is a minifig brick that is one stud in size, you can see Satele holding one in the image below). What exactly are Legos Cuusoo projects? Cuusoo is an official Lego website where people can suggest new set ideas. It started in Japan (Cuusoo effectively means “wish” in Japanese) and has only recently expanded to a global audience. Basically people submit projects to the set. If they can get 10,000 people to support the project then it gets reviewed. If it passes review, Lego will make their own version and market the product. In many ways it is Kickstarter but for Lego. What is the process that CUUSOO goes about to help decide what will be the next building sets for LEGOS? To clarify, Cuusoo is a line of Lego sets independent from what The Lego Group produces. It is a special line conceptually crowd sourced to the community. I find that really thrilling. How many companies can you think of would even consider letting the public have a direct say in what they produce? The start of any Cuusoo project is a submission by a user. This first submission is reviewed for appropriate content and to ensure that it does not contain any subject that have been declared off limits. Basically nothing profane or religious or political, the obvious stuff really. If it passes the initial review, then the project gets posted to Cuusoo and can start getting support. The most popular projects (currently only the top 1.4%) reach 1000 and get a license check is started. This second review includes a check for license availability. If Lego does the leg work and finds that the “construction toy” license is unavailable (as was the case for Mario Brothers and Doctor Who) then they archive the project and prevent anyone for creating new projects based on that subject. If it does not get archived it can continue forward to 10,000 support. First off, there is a check to see if there is “Brand Fit”. Basically, is it a product that Lego would sell? This is really only definable by Lego but a good indicator is, would it be appropriate to show to an 11 year old? There was a fantastic Serenity Firefly that got to 10k, everyone would have loved it, but as is often said, the Companions of Firefly are VERY different from the ones in Doctor Who, and that is just the beginnings of the troubles that Firefly could present. If Lego does not approve the brand fit, that is the end for the project. Then there are two simultaneous reviews. In one, TLG builds their own version of the project using their stringent design standards. In the other they check for marketability and try to acquire the license. The design review can take a few weeks but there is no telling how long the licensing negotiation will take. Currently we are still waiting to hear back on the Summer review. For obvious reasons The Lego Group was not shared the details of what the holdup is but my guess is that it has to do with Negotiating the complexity of the Back to the Future project. If it passes both the design and marketing review there is one final review in which one project is selected to become a product. It is still a relatively new process though so there are not that many projects to extrapolate from. Only three Cuusoo sets have been made to date. With the success of short fan films and even video games, based around LEGOS, do you think the brand has been showcased to a new generation? At one point a few Years ago Lego almost went bankrupt. Now they are a multimedia empire. They have the video games, board games, TV specials, TV series, apps, even clothing lines. In recent years it has been pushing hard to use popular IP more and more as well and has starting to market its own IP in new ways (Ninjao having a TV show and a Spinner game for instance). Think what you will of it but it has also make very successful inroads with the Friends line. I think Lego is doing a great job staying relevant to a changing demographic who has a constantly expanding field of entertainment opportunities available to them. Cuusoo is an evolution of this looking forward process, asking the consumer directly what they want. Sure, it is far from an instantaneous process but more and more we expect or entertainments to conform to what we want rather than us to conform to what is available. What does it take for the Corellian Defender building set to become a reality? Really all it needs is 10,000 votes to get the chance. That does not sound like much, especially given that there are possibly a million or more players of SWTOR, but it is actually a huge accomplishment. Currently only 4 projects, out of 3719, even have more than 5000 votes. What you actually need are people who not only support the project but get OTHER people to support the project. It almost has to go viral to get there in any legitimate timeline. I do what is called the 10k report on my Cuusoo blog mapping the progress of projects. Only the top five projects are expected to reach 10k in the next year. Some of the most popular projects will take over a decade at their current rate. My Corellian Defender is looking at a little over 4 years. F) Get it published in fan sites (Like Corellian Run) and forums. It helps to have a famous person related to the project somehow like the Cast of Firefly to the Serenity or Simon Pegg for the Winchester, or the creators of Minecraft for, well, Minecraft, but in lack of that it is very difficult to get the general population involved. You can help publicized a project online by contacting gaming and fan friendly websites. For instance, Kotaku accepts “tips” for articles at the email address tips@kotaku.com. Most web sites have some way to contact them with subjects you want them to publicize. That is the formula for getting any project to 10k actually. The thing is though that it takes a lot of people working in concert. The point of commenting on a project is that it causes it to show up more often on the front page of Cuusoo, so you are effectively “advertising” the project. If enough people tweeted the official SWTOR tweet asking for a retweet that would certainly get the word out. That is the trip to 10k though, after that….Well, there is the review I talked about before. 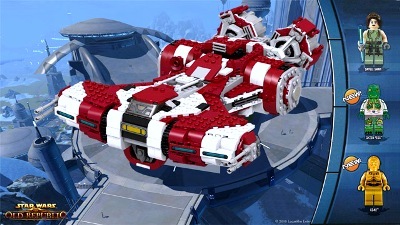 Given that Lego has already produced one SWTOR ship, it should sail through Brand Fit. As I have a full design it should not be hard for Lego designers to make their own, so no challenge there. Finally As Lego and Star Wars have a very healthy relationship, there should not be an issue with licensing. So, really it is about getting the 10k. How can fans or those wishing to show their support for this particular CUUSOO project get involved? What are the exact steps they need to do in order to vote? First off you need to be 13 to vote and you can only vote once. Lego is very good at rooting out people who vote more than once. If you have a Facebook or twitter account, you can activate a Cuusoo off of that. Otherwise you need to make an account but that only take a minute or two. Once you have an account, you just press the giant green support button on the project page. It will ask you a few question like How many do you want, what would you pay for it, and what do you like about it. People get a bit confused by the “what would you pay for it.” question. Everyone wants everything for free right? Well, this is actually the budget Lego will use for designing the production version of the set. 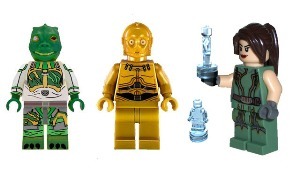 If everyone says they will pay $5 dollars then the Lego Group will produce a $5 set and you will get a $5 Corellian Defender. The set depicted is about a $90 set. That being said, I would much rather you support and put down $5 than not support a $90 set. I understand besides voting to support the Corellian Defender building set, you are also allowing fans to voice their input on the next SWTOR spaceship project. Is this correct and how do they go about this? This is absolutely correct. People who support the Defender can also cast a vote for my next SWTOR project. Only votes replying to this posting will be counted (so I can keep track of them), One vote per supporter. Just reply to that comment with your ship choice. Also I will be creating a cinematic based mini for each ship. As the Phantom does not have one currently, I will be using Watcher X. I will be pairing a companion with each as well (like Qyzen Fess for the Defender). Anything Else you want to add about Cuusoo? A lot of people put a LOT of stuff on Cuusoo and quality levels vary dramatically. If Cuusoo intrigues you and you want to take a look at what else is out there, I DO NOT recommend searching based on submission timeline (most resent) but instead using Descending Support (Start at the most supported and work your way down). This will weed out the “less popular” projects. You can do this by going to this page (http://lego.cuusoo.com/all/1) and clicking on “Most Supported” in the Sort By: category on right side column of the page. Secondly, if you want to try your hand at Cuusoo projects, You should do two things. Check out the projects that have 200+ support. The quality of your build and your presentation should be at least that good. Also do a search for your idea and see if it is on Cuusoo already. Nothing prevents you from posting an idea that is already on Cuusoo (as long as you don’t exactly copy someone that is), but if you want your project to succeed it has to be better than what is out there or at least attack the subject in a new way. There are, for example 10 Batpods (the motorcycle from the Nolan Batman movies) and only one or two of them stand out but people just keep posting them. Oh, also, I guess a third thing. I assume most of your readers would probably be more interested in making Star Wars projects but, just in case, It is pretty pointless to do any projects based on Hasbro properties (Transformers, G.I. Joe, My Little Pony, anything Dungeons and Dragons, etc…). They have their own “brick” toy line so they are not about to license anything to Lego. Your project can get to 1k and then it will get archived. How big and how many pieces will the Corellian Defender set contain? There are currently 793 parts in the set, not including figures or accessories. Why did you decide to add C2-N2 to the set? What was the thought process on the characters chosen to add with the set? There were a few thoughts on this….first, a lot of people go overboard with figures on Cuusoo projects. I like to be realistic. In fact, I did research on the subject (link here: http://blog.brick-hero.com/2012/06/cuusoo-analytics-realistic-minifig.html). But I decided to base my figure count on the Fury and stick with three. I wanted to go with a cinematic character for the main one and that lead to Satele Shan, which is already produced by Lego. Then I decided that I needed to go with a companion. Satele uses the double lightsaber so that implies she is a Consular. Qyzen Fess is a Consular companion AND Lego makes a Trandosian head so that seemed like an obvious choice. For the third, I wanted something that worked well with the story of the game play…and well that led me to C2-N2 as he/it is constantly with the ship. Ideally Lego would sculpt a new head for him but Lego only rarely makes new parts. Thanks to Glen for his time in helping make this article possible. You can keep tabs on Glen’s projects in the future by following him on Twitter. I will let my two helpers sum up their views about this topic. That’s it for this week’s Community Checkpoint. Would you like to have your guild, event or server group highlighted on Corellian Run Radio? All you need to do is submit your guild or event’s website and some basic information in an email to us at, jason@corellianrun.com corellianrun@gmail.com. You could be who we highlight next here at Corellian Run Radio. Thanks and see you next week!